Broiche is part of a group of yeast raised Breakfast Pastries called Viennoiserie. When I took a week long Viennoiserie Class at the San Francisco Baking Institute (SFBI) we made this bread. It is an enriched bread, which means it is made with lots of butter an eggs. This gives it a buttery flavor and a wonderfully light and tender crumb. Brioche has so many uses, both sweet and savory. In this recipe we are making it in loaf form. A few notes on technique and ingredients. This dough is kneaded for a long time (20 to 25 minutes) which produces a strong dough that cleans your mixing bowl and is silky smooth. If you're new to bread making, I would watch the video as I show you an easy way (the 'window' test) to determine if your dough has been mixed to the correct consistency. After the first fermentation (proofing), I like to refrigerate the dough overnight. This improves the flavor of the Brioche and also makes the dough much easier to work with. Place the cold butter between two sheets of parchment or wax paper. With a rolling pin, pound the butter until it's pliable but still cold. Cut the butter into pieces and add it to the dough. Knead the dough, on 2nd speed, for another 10 to 15 minutes or until the dough cleans the bowl and is smooth (not sticky) and elastic. To check to see if the dough is fully kneaded, use the 'windowpane' test. To do this, start with a small fistful of dough. Gently stretch it. For a fully kneaded dough you should be able to stretch the dough quite thin, without it tearing, so that you can almost see through it. Next morning prepare two - 9 x 5 x 3 inch (23 x 13 x 8 cm) loaf pans. Heavily butter or spray the pans with a non stick vegetable spray. Then remove the dough from the refrigerator and divide into 12 equal-sized pieces (about 80 grams each). Then, working with one piece of dough at a time, flatten into a round. (You may want to lightly flour your hands.) Take the edges of the dough and fold them into the center and gently seal. Then flip your dough over so the smooth side is facing up. With the palm of your hand rotate the ball of dough on your surface to create surface tension and to seal the edges of the dough completely. Place six rounds of the dough in each loaf pan, placing them on a slight angle to each other (this will give the Brioche a braided look) (see video on how this is done). Cover loosely with plastic wrap and let proof at room temperature (about 73 - 76 degree F) (23 - 24 degree C) until nice and puffy and almost doubled in size (because the dough is very cold, this could take 2 1/2 to 3 hours). Next, preheat your oven to 350 degree F (180 degree C). When ready to bake, remove the plastic wrap and, with a pastry brush, lightly brush the tops of the Brioche with the beaten egg. If desired, sprinkle the tops with Pearl Sugar. Place in the preheated oven and bake for about 25 to 30 minutes or until golden brown and shiny. If you tap the bread it will sound hollow. About halfway through baking turn your pans front to back to promote even baking. 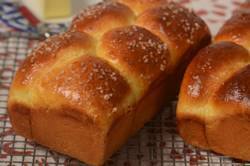 (Internal temperature of a fully baked Brioche should be about 190 degree F (88 degree C)). Remove from oven and place on a wire rack to cool for about five minutes. Then remove the breads from their pans, placing the breads top side up on a wire rack. Makes two - 9 inch loaves of Brioche.